Kanji or Rice Water as it is called in English is an edible drink, which most people would have consumed some time or the other in their lives, especially in their childhood. Kanji, which is the water drained from boiled rice is said to contain medicinal properties and hence recommended as a home remedy for sick and ailing people as a healing liquid. 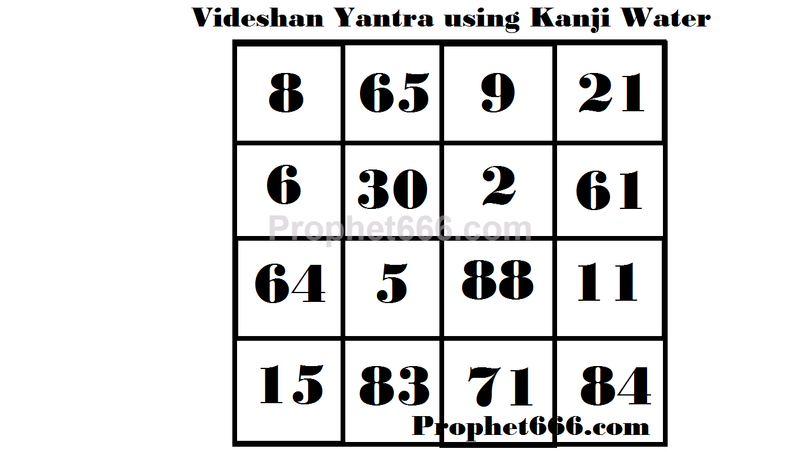 The Videshan Yantra described by me in this post is used in an Indian Paranormal Yantra Experiment to cause fight, disagreements and opposition in the house of any opponent, enemy or competitor. The Tantra for performing this Videshan Yantra Experiment is Tamas Guni and only recommended for people well versed in conducting such fearsome Indian Tantric Experiments. The Videshan Yantra Experiment can be started on any day and the Videshan Yantra shown by me in the image should be prepared on a Paan or edible Betel leaf in English. The practitioner should draw the Yantra with Kanji using a pointed wooded stick. Then, he should burry the Yantra in a Graveyard, Smashan Bhoomi in Hindi. After, 21 days the Videshan Yantra gains paranormal occult powers and hence the practitioner should remove it from the Graveyard after 21 days. The, to cause fights in the home of an enemy, he should face the West Direction and throw the Videshan Yantra in the house of the enemy. 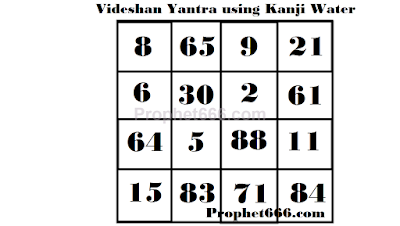 This concludes the Videshan Yantra Vidhi as described in the Tantra. guru ji please give some videshan mantra for far away enemy.. it is not possible for me to put anything to his or her house because it is far away.. please guruji i need a solution..